Delve into the art and life story of Michelangelo during a private 3-hour tour of Basilica di Santa Croce and Casa Buonarroti. Make your own way to the Piazza Santa Croce to meet your guide. 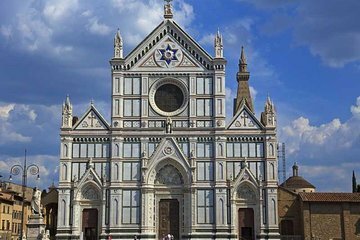 Walk across the plaza to the Basilica di Santa Croce, which was designed by Arnolfo di Cambio. Inside, see frescoes by Giotto that decorate the Bardi and Peruzzi Chapels, along with the Pazzi Chapels and more. Hear detailed commentary about Michelangelo, who is one of the Italian masters buried at Santa Croce. After touring the chapel, continue to the Casa Buonarroti, a museum dedicated to Michelangelo's life. See famous pieces by the artist when he was young, such as 'Madonna of the Steps' and 'Battle of the Centaurs.' Your guide shares stories about the artworks, architecture, and history of the sites throughout your 3-hour tour.